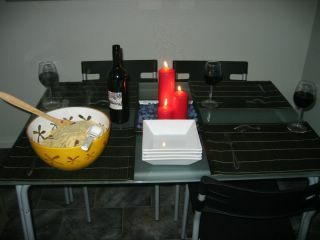 Earlier this week I cooked dinner for my good friend Daniel, who has recently moved out of home to his own place. 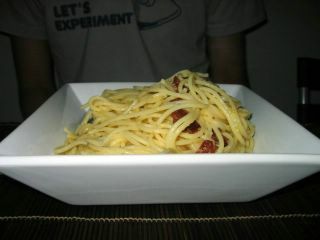 Daniel just loves creamy food, so I made spaghetti carbonara and chocolate Cambridge creams. The spaghetti was not actually from Happy Days, but the dessert was. 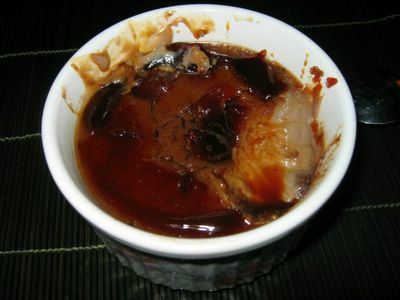 Chocolate Cambridge creams are similar to crème brûlée. 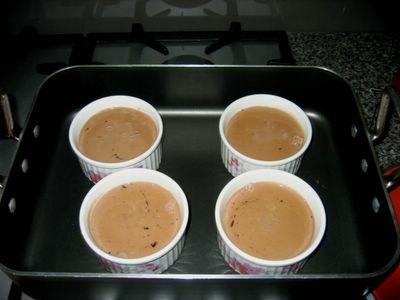 You start by making an ordinary custard (with 1 tsp cocoa powder added), then line 4 ramekins with finely chopped chocolate, and pour the custard over. You then bake it in a waterbath until almost set. Jamie says you can make the custards a couple of days in advance and store them in the fridge, which I did. On the day of the dinner, I made the sugar topping. I don't own a blowtorch, so I made caramel in a pan and poured it over. This didn't look as good as a blowtorch would have, but it still made a tasty crunchy topping. I will probably buy a blowtorch soon. I also chopped up the bacon and made the cream sauce on the day at home, and transported it all to Daniel's place. (Having just moved in, I wasn't sure what utensils he owned). When I got there, I boiled the pasta, fried the bacon and stirred it all together. Then dinner was ready! Here is the finished Cambridge cream. It was very tasty - the custard had a lovely texture and light chocolate taste, but it was so rich! Do 8 egg yolks and 375ml of double cream for 4 servings seem a bit much? Also, the chocolate layer at the bottom had totally solidified, increasing the richness - I guess it would be a better idea to chop it up more finely, and not make it so far in advance. Delicious as it was, we were all stuffed about halfway through. I would make it again, but in much smaller containers. I think the recipe could easily feed 8 people, in cute little dinky ramekins or espresso cups. Mmm... the food looks delicious! Sarah, i love the new layout of this blog...pls tell me how did you put your picture on the head-bar???? I love your blog! I found it when I was looking for pictures of the Mostarda di Venezia, and I was relieved to see that yours looked identical to mine! Does it taste nice? Mine should be ready just before Christmas, I am very excited about it. It was so time consuming to make, until we realised that we'd put the food mill together the wrong way round, and then it was much easier. Anyway, good luck with your cooking - you have inspired me to cook my way through some of my books as well. sarah, i think it's wonderful how you made dinner for your friend! :) everything looks beautiful as usual and i'm happy to see you venturing into unchartered territory! Hey, before you go out and spend your money on a blow torch, try heating up the back of a big metal spoon (make sure it doesn't have a plastic handle!) 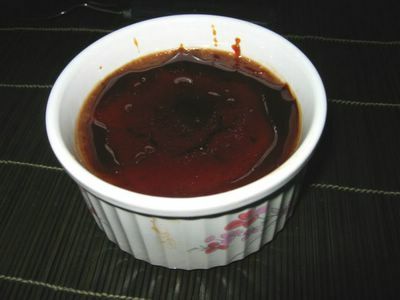 until it's red hot (hold it using oven mitts) and use the back of the spoon to melt your sugar on the top of your creme brulee's. This works a treat! Saves you $20+ on a blow torch!